Elizabeth Warren chaired the Congressional Oversight Panel, which was created by Congress to "review the current state of financial markets and the regulatory system." She is also the Leo Gottlieb Professor of Law at Harvard University. She is currently running for the U.S. Senate (in 2012). Elizabeth Warren on COP February report. The Congressional Oversight Panel, which Ms. Warren chaired, was created to oversee the expenditure of the Troubled Asset Relief Program (TARP) funds authorized by Congress in the Emergency Economic Stabilization Act of 2008 (EESA) and to provide recommendations on regulatory reform. "The Panel is empowered to hold hearings, review official data, and write reports on actions taken by Treasury and financial institutions and their effect on the economy. Through regular reports, the Panel must oversee Treasury's actions, assess the impact of spending to stabilize the economy, evaluate market transparency, ensure effective foreclosure mitigation efforts, and guarantee that Treasury's actions are in the best interests of the American people. In addition, Congress instructed the Panel to produce a special report on regulatory reform that analyzes 'the current state of the regulatory system and its effectiveness at overseeing the participants in the financial system and protecting consumers.' The Panel issued this report in January 2009. Congress subsequently expanded the Panel's mandate by directing it to produce a special report on the availability of credit in the agricultural sector. The report was issued on July 21, 2009." It is impossible to buy a toaster that has a one-in-five chance of bursting into flames and burning down your house. But it is possible to refinance an existing home with a mortgage that has the same one-in-five chance of putting the family out on the street... Similarly, it’s impossible to change the price on a toaster once it has been purchased. But long after the papers have been signed, it is possible to triple the price of the credit used to finance the purchase of that appliance ... The difference between the two markets is regulation. After detailing various ways that the financial industry fleeces consumers, she concluded by calling for a Financial Product Safety Commission that would "establish guidelines for consumer disclosure, collect and report data about the uses of different financial products, review new financial products for safety, and require modification of dangerous products before they can be marketed to the public." While progressives celebrate Warren for her fight against the big banks and the financial industry's lobbying arm, they have kept silent over the fact that she has enlisted with another powerful lobby that is willing to sabotage America's economic recovery in order to advance its narrow interests. It is AIPAC, the key arm of the Israel lobby; a group that is openly pushing for a US war on Iran that would likely trigger a global recession, as the renowned economist Nouriel Roubini recently warned. The national security/foreign policy position page on Warren's campaign website reads as though it was cobbled together from AIPAC memos and the website of the Israeli Foreign Ministry by the Democratic Party hacks who are advising her. It is pure boilerplate that suggests she knows about as much about the Middle East as Herman "Uzbeki-beki-stan-stan" Cain, and that she doesn't care. Warren's statement on Israel consumes far more space than any other foreign policy issue on the page (she makes no mention of China, Latin America, or Africa). To justify what she calls the "unbreakable bond" between the US and Israel, Warren repeats the thoughtless cant about "a natural partnership resting on our mutual commitment to democracy and freedom and on our shared values." She then declares that the United States must reject any Palestinian plans to pursue statehood outside of negotiations with Israel. While the US can preach to the Palestinians about how and when to demand the end of their 45-year-long military occupation, Warren says the US "cannot dictate the terms" to Israel. Warren goes on to describe Iran as "a significant threat to the United States," echoing a key talking point of fear-mongering pro-war forces. She calls for "strong sanctions" and declares that the "United States must take the necessary steps to prevent Iran from acquiring a nuclear weapon" -- a veiled endorsement of a military strike if Iran crosses the constantly shifting American "red lines." Perhaps the only option Warren does not endorse or implicitly support is diplomacy. Her foreign policy views are hardly distinguishable from those of her Republican rival, who also marches in lockstep with AIPAC. The crisis facing the middle class started more than a generation ago. Even as productivity rose, the wages of the average fully-employed male have been flat since the 1970s. But core expenses kept going up. By the early 2000s, families were spending twice as much (adjusted for inflation) on mortgages than they did a generation ago -- for a house that was, on average, only ten percent bigger and 25 years older. They also had to pay twice as much to hang on to their health insurance. [. . .] While the middle class has been caught in an economic vise, the financial industry that was supposed to serve them has prospered at their expense. Consumer banking -- selling debt to middle class families -- has been a gold mine. Boring banking has given way to creative banking, and the industry has generated tens of billions of dollars annually in fees made possible by deceptive and dangerous terms buried in the fine print of opaque, incomprehensible, and largely unregulated contracts. On The Daily Show, Warren said, "This is America's middle class. We've hacked at it and chipped at it and pulled on it for 30 years now. And now there's no more to do. Either we fix this problem going forward or the game really is over." Elizabeth Warren "has written eight books and more than a hundred scholarly articles dealing with credit and economic stress. Her latest two books, The Two-Income Trap and All Your Worth, were both on national best seller lists. She has been principal investigator on empirical studies funded by the National Science Foundation and more than a dozen private foundations. Warren was the Chief Adviser to the National Bankruptcy Review Commission, and she was appointed as the first academic member of the Federal Judicial Education Committee. She currently serves as a member of the Commission on Economic Inclusion established by the FDIC. She also serves on the steering committees of the Tobin Project and the National Bankruptcy Conference. The National Law Journal has repeatedly named Professor Warren as one of the Fifty Most Influential Women Attorneys in America, and SmartMoney Magazine recently designated her one of the SmartMoney 30 for 2008. She was also one of eight law professors to be named on the Leading Lawyers in America list compiled by Law Dragon." ↑ Congressional Oversight Panel, accessed October 19, 2009. ↑ The reports of the Congressional Oversight Panel are available at the Congressional Oversight Panel website. ↑ Max Blumenthal, Progressive Democratic Hero Elizabeth Warren Enlists to Serve AIPAC's Pro-War Agenda, Common Dreams, 26 February 2012. Elizabeth Warren, Leo Gottlieb Professor of Law, in Harvard Faculty Directory. James Scurlock, The TARP Queen, The Big Money, Slate, April 23, 2009. 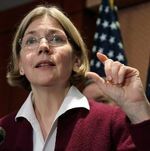 Michael Kranish, "In Fight Over Credit Rules, Elizabeth Warren Wields a Plan," Boston Globe, November 3, 2009. Elizabeth Warren: America Without a Middle Class, Huffington Post, December 3, 2009. Tim Fernholz, Elizabeth Warren on Financial Regulatory Reform, Newsweek, December 7, 2009. Elizabeth Warren: Bank CEOs not admitting to failure, PRI and WNYC's The Takeaway, January 14, 2010. Shahien Nasiripour, Elizabeth Warren Warns About Commercial Real Estate Crisis, 'Downward Spiral' For Small Businesses, Local Banks, Huffington Post, February 11, 2010. This page was last edited on 27 July 2017, at 17:33.